I predict a riot : well almost! Twenty years ago, I predicted that the England football team should stop playing 4-4-2, as this system was outdated, one-dimensional and would guarantee failure at every major international tournament. Hardly anyone believed me then, but pretty much everybody agrees now. I also predicted that fewer and fewer people would turn out to vote at elections and this also seems to be true. In terms of wine, a few years ago, I came to the conclusion that perhaps Vinho Verde Tinto was not quite the joke it was sometimes made out to be – even the Portuguese considered it a rather eccentric style of table wine for the home market only. I’ve now seen it advertised in the wine trade press for UK consumption! However, ten years ago, following a holiday to Sicily, I rated the island as a future wine force, as the signs of quality were starting to shine. 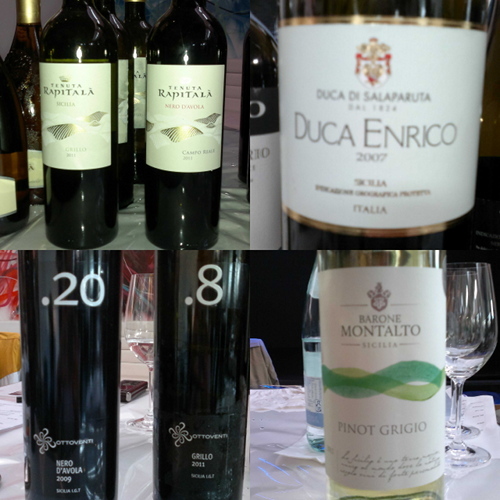 Having just attended the Wines of Sicily tasting in London, I can definitely say that I was not wrong. If you think you know Pinot Grigio, then think again. Often dismissed as a high yielding, low quality grape, could Barone Montalto’s "Pinot Grigio 2011" be the future? Their expression is richer than a typical example of this variety. With fragrant green apple on the nose, followed by a citrus palate and a nutty finish, Barone Montalto have created a 12.5% abv Pinot Grigio that could change your image of this grape. A perfect accompaniment to chicken dishes or creamy risotto. Tenuta Rapitalà plant a range of native Sicilian and international grape varieties. Their elegant 100% Chardonnay "Grand Cru 2010" is fruity with honey overtones and a creamy finish due to the wine sitting on its lees in French oak barriques. Their "Hugonis 2009" is 50% Cabernet Sauvignon and 50% Nero d’Avola. These two varieties are vinified and aged separately to produce a complex, rich and fruity wine with cherry notes. Ottoventi is another winery with an interesting range of grape varieties and wine styles. Their good value wines, include the floral, delicate citrus-tinged ".8" from 100% Grillo, an indigenous white grape variety often used as the base of Marsala, but also capable of producing dry single varietal wines. The pick of the bunch, but not a cheap option, was "Duca Enrico 2007" from Duca di Salaparuta, available from Moreno wines. A very complex wine from 100% Nero d’Avola (the most well-known red grape of Sicily), this has plenty of black fruit on the nose and palate, which remains on the aftertaste. The oak complements the fruit, without in any way detracting from it and the result is a perfectly balanced wine, in terms of flavour, tannin and alcoholic strength. Their "Lavico 2008" from 100% Nerello Mascalese, planted on the slopes of Mount Etna and considered by some as a more gentle and noble Sicilian red grape variety, is also elegant and aromatic with a fruity and slightly herbal palate. Indeed, Etna wines are considered Burgundian in style and have been feted by wine experts as wines of the future. Wine is an area that is constantly developing. For instance, for many years, I felt that while English sparkling wine was gaining a world-class reputation, English still wine was too often unfairly scorned by wine experts. I could see that quality was starting to come through and it was only a matter of time before people began to take notice. While, it’s still relatively early days, this is certainly coming true now and Camel Valley is one example of an English winery capable of producing good quality still and sparkling wine. So what next – a prediction on the future of healthcare? No thanks – I’ll leave that to the Kaiser Chiefs!